We believe in providing quality work for all of our clients, so we take the time to get specialized training for each manufacturer. We are certified collision repair centers for a variety of manufacturers! Since 1954, Roy Rogers Body Shop in Laurel, MS has been providing top quality auto body repair and 24 hour towing services. Family owned and operated, this legacy Laurel auto body repair was founded by Rufus Elton “Roy” Rogers. Roy got his nickname from his wife, Betty, who he met in Glasgow, Scotland during World War II. She gave him the nickname in honor of the Cowboy Hero. In 1955, one year after its inception, Roy Rogers Body Shop moved to a new building on Mason Street and continued to build and add to the building. In 1979 Roy and Thomas moved Roy Rogers Body Shop to an even larger facility with special buildings for paint & refinish, body & framework, and offices. This body shop has been a “hero” to motorists throughout Laurel ever since. Roy Rogers Body Shop has established the highest standards for this community, making them the go-to facility for worry-free collision repairs. 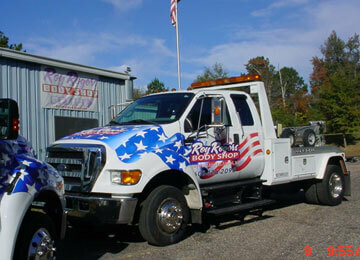 Tow truck drivers are always Johnny-on-the-spot with a variety of services, including towing, lockouts, and jumpstarts. Their faithful service to motorists throughout Jones county has been “saving the day” for half a century. They believe having a family run business for so long has allowed all the technicians to focus more on craftsmanship and quality. Roy Rogers Body Shop works hard to deliver on its reputation as the best collision repair service in Laurel, MS. They stand behind all of their auto repairs with a lifetime warranty. With 15,000 square feet of collision repair and paint facilities, Roy Rogers Body Shop can see nearly 120 vehicles per month, which makes their customers happy with such timely repairs. The technicians in our Laurel collision repair shop are ASE and I-CAR certified and the company focuses heavily on continuing training and education. They stay abreast of all the latest technologies to guide customers through the collision repair process faster and with expertise. They insist on use quality OEM parts for all parts replacements. Collision repair services will never compromise vehicle performance and aesthetics. Now, Roy’s son, Thomas Rogers runs the biggest and most reputable collision repair shop in Jones County. Roy Rogers Body Shop is a Direct Repair Shop for Shelter. They are, of course, happy to work with any customer’s insurance provider. Roy Rogers Body Shop is closely connected and always involved with the community. As annual sponsors for Laurel’s Christmas Parade, the Laurel Little Theatre, and the Lauren Rogers Museum of Art, they stay very active in this community. Stop in, call, or contact us for any questions you may have regarding your collision repair or towing needs!